As the Associate Director of Global Pro Bono at PYXERA Global, Renay works with senior leadership to implement corporate social responsibility programs for the private sector focused on engagement in emerging markets, leadership development, and responsible supply chain development. Prior to joining PYXERA Global, Renay managed the Grassroots Exchange and Education projects for the Japan Foundation Center for Global Partnership in New York. In this capacity she worked closely with NGO’s, universities, and think-tank’s to develop opportunities to strengthen people-to-people relationships between the US and Japan. Renay is committed to global education, social responsibility, and philanthropy as evidenced by her 10+ years of experience in these fields bridging gaps between the education, non-profit, and private sectors. She has lived and worked in Japan and Greece, and has traveled to over 20 countries in Middle America, Latin America, Europe, and Asia. 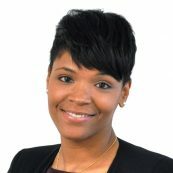 Renay holds a MS in Higher Education/Post-Secondary Counseling and a BS in Business Management/International Business, both from West Chester University in Pennsylvania.